Wow, that was a mouthful. I mentioned a few posts ago that we were fortunate enough to host a small dinner gathering last week in Jonathan's apartment. There were just four of us: Jonathan and I and two lovely guests, but it was certainly occasion enough to spend a little time preparing the menu, do some rare day-ahead planning, and even purchase a novelty item or two (this time it was goat's milk, with which we made cardamom ice cream). Planning for the dinner reminded me how much I love, well, planning for things like this. I can spend hours dreamily shuffling through menu ideas in my mind, formulating little mental shopping lists, and searching for inspiration in cookbooks and on the blogosphere. So that's exactly what I did. My only constraint was that this was to be a vegetarian meal, which really isn't much of a constraint for me, since I'm happy to cook and eat vegetarian-ly much of the time. In planning the menu, I decided pretty early on in the game that the protein of the meal was going to be a frittata. I can't say enough about the frittata. It really is one of the most versatile dishes in my repertoire, and it can be classy, casual, chock full of fancy stuff, chock full of crap you found in the back of your fridge, brunch, lunch, dinner, 2am snack...so yes, it is versatile. Oh yeah, it also is really yummy. I also knew I wanted a salad. I mean come on, that's pretty basic. But I needed something else, too. Something carb-y, something filling but not too heavy, something novel and fancy but not too involved. I was toying with the idea of making a panade, which is essentially a savory bread pudding that uses stock for the liquid and lots of cheese and vegetables. It seemed too heavy, though. I discovered it in my brand new Zuni Cafe cookbook, which, while incredible, suffers from the restaurant cookbook fate of having lots of recipes that, frankly, will never make an appearance in my kitchen. Flipping through the rest of the book, though, I saw a recipe for farrotto - a risotto-like dish made with Italian farro instead of rice. Having recently discovered farro (a whole grain similar to spelt), Jonathan and I are rather obsessed with it. Sure, it's a "whole grain," but it has a wonderful, light, wheaty flavor and al dente texture that make it much more pleasant than, say, wheat berries. Not that I don't like wheat berries. That glimpse of the title of the recipe was all the inspiration I needed. The Zuni recipe calls for some herbs and other ingredients, but I just took the farrotto idea and ran with it. Right to Whole Foods, where I picked up some fresh rosemary, butternut squash, and cute little cipolline onions. And thus this long-winded recipe was born. Some notes on the recipe: I opted for red wine instead of the traditional white wine in this recipe, because I thought the red would stand up to the strong flavors of the dish: rosemary, vinegar, squash. I also made this a "rosemary-scented" recipe because I really don't like the texture of rosemary in my food. I like just a hint of the pine-y taste, so I infused a sprig or two in some olive oil and coated the squash in it before roasting. And about that roasting - it seems time consuming, but it really makes for outstanding and subtle flavors. This can easily be done a day in advance, as can braising the onions. I used an Epicurious recipe as a guideline for braising the onions, so I won't include that step here. My version went a little like this, though: boil and peel the onions, saute them (whole) in some oil, add vinegar, wine, and stock, and simmer until soft and sauce has reduced. Finally, save some of the onion-braising sauce to drizzle over the farrotto. Yum. Infuse olive oil and roast squash: heat 1/4 c. oil in a small skillet and add a sprig or two of rosemary and 2 lightly crushed (but still whole) garlic cloves. Oil shouldn't smoke, but should just barely bubble around the edges. Swirl pan and remove from heat. Set aside to cool. Meanwhile, dice squash into small cubes and preheat oven to 400 degrees. When oil has cooled, drizzle it over the squash. Add salt and pepper and roast until tender, about 25 min. Set aside or refrigerate. Make farrotto: Finely chop garlic and onion/shallots. Set stock over low heat to simmer - it must be hot when you add it to your farrotto. Heat remaining oil and butter in a heavy-bottomed pan and saute until soft, but not browned. Season with salt and pepper. Add farro and stir to coat in the oil. After a minute or two, add the wine, stirring, until almost absorbed. 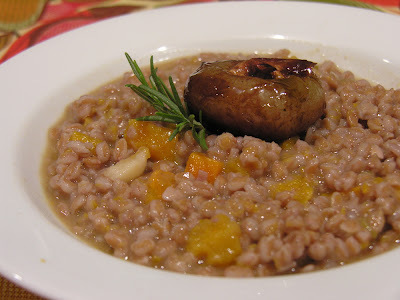 At this point, continue making the farrotto like any risotto: add ladlefuls of hot stock and stir until almost absorbed. 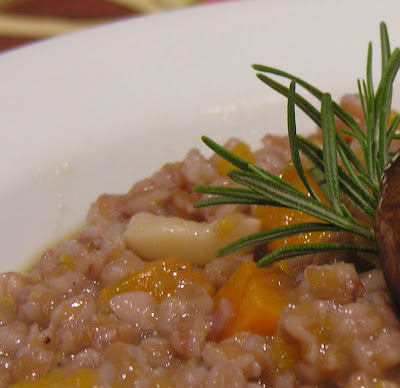 The farro takes about 20-25 minutes to reach the al dente stage. Just before it's finished cooking, add the squash and a handful or two of cheese. Stir until completely heated through and combined. Serve immediately, and top each dish with a cipolline onion and a drizzle of balsamic glaze. Revel in the praise of your guests. Yes, I know, it seems long. It really isn't so hard though - I was preparing it after a glass and a half of wine (trust me, this is not trivial) and it came out just beautifully. It really is best right off of the stove, when it is still a bit soupy and the broth is thick and starchy, but it makes great leftovers, too. Just reheat with a bit more stock.